Pure Anywear and Positive Vibrations Sound are together again promoting a series of Roots & Culture shows in Nevada City. 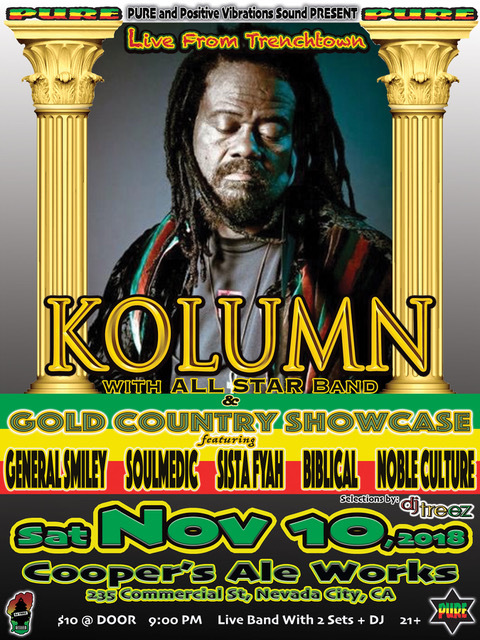 We are kicking it off with Kolumn, a Rasta Elder outta Trenchtown and a Gold Country showcase featuring General Smiley, Soulmedic, Sistah Fyah, Biblical & Noble Culture. Both sets will be backed by an all star band led by Tuff Lion. We also have Army and Ark Aingelle on December 15 and Abja on January 11. Save the dates, I hope to see you there. Edited 1 time(s). Last edit at 10/19/2018 06:55PM by DJ Treez. I'm not gonna miss any of those. Looking forward to seeing you Nomo. I hope to see some folks out tomorrow night. We are all set to deliver an amazing show. Sounds like plenty a special guests, i'm gonna go early, and stay late!